This morning, Sydney woke up to an air pollution problem caused by some hazard reduction burns in the Blue Mountains to the West of Sydney. For those going to work in the CBD, this is what the sky looked like. We don't know how high the PM 2.5 and 10 levels climbed because there aren't any air quality monitors in the inner parts of Sydney. Out in the far Western suburbs, the situation was even worse, with some residents even experiencing smoke inside their homes. We'll return to yesterday's pollution event but firstly, we need to update readers on the nitrogen dioxide problem that we discussed in our last story. Haberfield Public School Parents and Citizens have been given an explanation for the spike in Nitrogen Dioxide on the monitor at their school last week. They've also been that they can expect an explanation for concerns they raised in early April about high pollution readings in March this year. 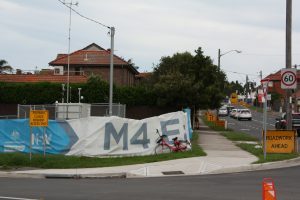 On Friday, WestConnex M4 East community engagement manager Michael Johnson wrote to Haberfield P&C Association representative Sherril Nixon explaining that a faulty NO2 monitor had been removed so it could be fixed in a laboratory. Another monitor was installed but that one turned out to be faulty too. After Ecotech became aware of the problem, the 'faulty' monitor and readings were removed. A new NO2 monitor was installed last Tuesday and readings returned to their normal range. "We have lost a few days of data but there is nothing to suggest that there were elevated levels of NO2 during this period, he explained. We are still waiting for RMS to answer our questions about why it took so long to discover the error; and why there have been so many unrealistic 985 readings for PM 2.5 ? These tend to occur when PM 2.5 levels are high so removal could tend to suppress the results. An RMS spokesperson Dan Sliburn-Evans told us we could expect answers by early next week. On March 23rd, we reported that the search engine on the Ecotech site restricted users to only being able to retrieve 30 days of data. 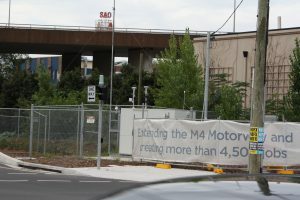 The approval conditions for the WestConnex M4 East require that the information is public. Up until Friday, there was a gap of nearly a month between the March monthly report and availability of information on the real-time monitor. After our story and requests from the Haberfield school community, SMC has instructed Ecotech to open up the search engine so you can search back to December 19 when the monitors were commissioned. Search showing PM 2.5 levels recorded at Ecotech Haberfield School monitor from 1/1/2018 - 29/5/2018. 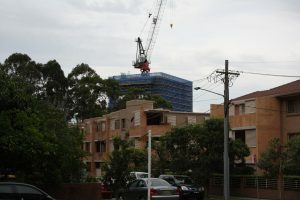 Looking west from Powells Creek monitor towards hundreds of apartments near pollution stack which is being built at Strathfield. There have been scores of alerts about poor air quality in Western Sydney this year. For many residents, especially those who family members with respiratory problems, it's a worrying and serious health issue. In the Inner West, however, it has tended to be a hidden issue. Today has been an exception with the SMH reporting that Sydney's air quality was worse that Beijing's air quality. 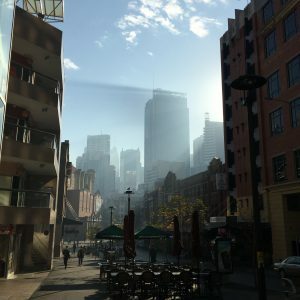 When we first started reporting on WestConnex and Air quality in March, we suggested that the real-time monitors do provide an unusual opportunity to begin to understand more about air quality in the Inner West, where there has been little publicly available data on air quality, including near busy roads. We've also observed how the PM patterns follow and divert from regional patterns and how air quality can differ substantially at even nearby sites, depending on the local conditions and they way the wind is blowing. Today has provided a great example of how the monitors can provide information. At 3 am this morning, the PM 2.5 at Powell's Creek near the junction of Parramatta Rd and the M4 tollway was 109 u/gm3 and the PM 10 was 73 u/gm3. At Ramsay Street Haberfield, the PM 2.5 was 68 u/gm3 and the PM 10 92.7 u/gm3. Just several blocks away on the grounds of Haberfield School, the PM 2.5 was 35 u/gm2 and PM 10 was 92.7. The levels remained high all morning until just before midday when the wind swung northwards, the PM levels plummeted in the Inner West. At that point, the PM levels fell back to a more usual pattern with Haberfield School the highest PM 2.5 reading at 11 u/gm3, which is still 3 u/gm3 above the national annual average limit of 8. Since we started following the data in Mid-March, Haberfield School has been above 8 u/gm3 for approximately 77% of readings. This compares to 62% at Ramsay Street, Haberfield and 60 % at Powell's Creek. The other three monitors are lower but no monitor has recorded average levels of 8 or below so far this year. On the other hand, Haberfield School does not have such high levels of PM 10 as Ramsay Street and Powells' Creek, Strathfield. 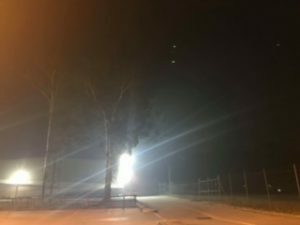 This is possibly because the HPS is behind a lot of trees and not on any road although it is less than 200 metres from the construction site on Parramatta Road. Nevertheless, the HPS PM 10 levels are averaging above 21 u/gm3 levels so this year. ( The national limit is 25 and the Victorian limit is 20 u/gm3.) The average figures hide the spikes such as the one of PM 400 u/gm3 on April 9th. It is also know that there is a serious risk that hundreds of residents living. working or being cared for in a childcare centre closer to the construction site are experiencing higher levels of PM 10 than Haberfield School. 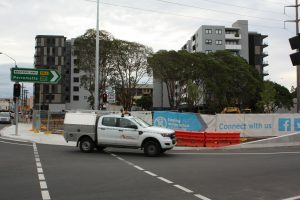 The Powell's Creek monitor stands near the junction of Parramatta Rd and WestConnex M4, not far from Strathfield Station. After 5 months of 2018, Powell's Creek is above the national average annual limit for both PM 2.5 and 10. This does not include ultrafine particles, which may be even more dangerous, but are not being measured by the NSW Office of Environment and Heritage or WestConnex. At the moment the levels could be affected by motor emissions and construction of the M4 East. Since the toll went on the M4 last year, more motorists are using Parramatta Rd. Even after the tunnel opens , traffic will tend to concentrate in this area. Looking west from the Powell's Creek monitor, you can see that a large square towerlike building is emerging. This is a giant unfiltered pollution stack. When the tunnel opens, toxic emissions will spew from this tower. Where they go will depend on the direction and speed of the prevailing wind. New apartments are springing up to the east, west, north and south of the monitor. Many residents have no idea that the stack will be well under 300 metres from them or that there will be no monitoring to the West of the stack where thousands of residents live. It's hard to fathom a planning system that would allow this to happen. Only one driven by property developer interests is an answer that comes to mind. I would like to know why the PM 2.5 readings at Haberfield school (closest to my home) appear to be consistently higher than other monitored sites and why Haberfield has shown pm 2.5 readings consistently higher than 10 since mid March 2018? PM2.5 daily reporting average of 25µg/m3 and an annual average of 8µg/m3 are relatively recent requirements from the National Environment Protection Council. Please refer to the following website for further information; http://www.nepc.gov.au/resource/variation-ambient-air-quality-nepm-%E2%80%93-particles-standards .It should be noted that particulate pollution has been continually falling over several decades and will continue to fall in the future. 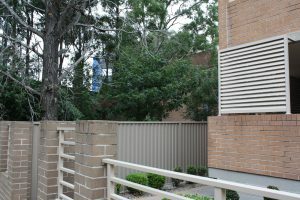 The readings experience at the Haberfield Public School (HPS) monitoring station are very similar to the other monitoring stations on the New M4 and EPA monitoring stations across Sydney. There is no indication from the results so far that the HPS monitoring station is measuring anything other than the regional pollution level with normal variations across the day. We presume that Johnson's reply was put together on advice. We would really like to know who gave him that advice. It's delivered with the same note of reassuarance as RMS has used with thousands of residents who took their concerns about air quality to the EIS sessions. At no time were they ever told that PM 2.5 levels might average 13.5 u/gm3 as they did at HPS in March 2018. According to his Linked In account, 0ne of Johnson's responsibilities as a community engagement manager are to "proactively identify issues of potential public exposure" and "navigating a politically sensitive environment." SMC has promised to send an explanation for the Haberfield School readings to the Haberfield P & C this week. We look forward to hearing whether they repeat the statements made to Paul Jeffreys or whether they take a more serious approach and provide detailed, transparent evidence to support their claims. We also note that one of Michael Johnson's achievements is developing a great relationship with Strathfeild Council. We'd like to know what discussions, he's had with them about the pollution levels at the Powell's Creek monitor. Western Sydney residents are suffering dangerous impacts of air pollution. Today's high readings are a wake-up call for all of Sydney as bushfires and burn-off days are likely to increase with climate change, along with serious health impacts on those who live, work and study in the Sydney basin. Two weeks ago, Western Sydney resident Kim Vernon was one of a number of residents to raise serious concerns at an Independent Planning Commission hearing into the proposal to put a toxic incinerator near where she lives in Erskine Park. Here is a slightly edited version of what she said. 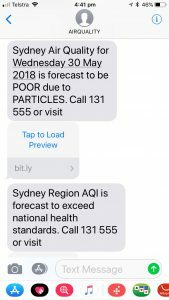 Each day I receive air quality alerts on my phone for the Sydney area and from 1st January this year, out of 134 days so far, we have had only approximately 63 good air quality days, the rest were fair and poor air quality days. This is less than half and also before an incinerator adds to these outrageous numbers. Not only that, I have received approximately 70 alerts for exceedances of the National Health Standards for air quality, ozone levels and particulate matter. With this knowledge also comes fear of the problem you are living with and the dangers it presents to your health. A simple daily walk becomes another worry in your life, is it even safe to go out in this? Which is worse, not going for the walk or sucking in these dangerous toxins while you do? All of these toxins are settling on our food and water and entering the food chain, why doesn’t anyone care, where will it end? All of this weighs heavily on your mind and is a continued stress that no one needs. I am astounded and appalled that I have had to waste so much of my time over the last few years to fight this ( Waste Incinerator plan) when the information is readily available, simple to understand and yet, the government, who is supposed to be in place to do the right thing by the people, continue to give more and more chances to allow this insanity to continue. Before we plough ahead with plans for a 24 airport, more tollways, hundreds of thousands more apartments right on top of busy roads and waste dumps, let alone toxic incinerators, anywhere in Sydney, we must pause and consider the impacts of climate change and air pollution on our community's health before it is too late. As we explained in our first piece, 'national exceedances' that can be linked to bushfires and hazard reduction will be discounted as 'exceptional events' under the National air pollution reporting rules. But this doesn't make them less real or dangerous. It also doesn't mean that their impact may not be exacerbated by roadside pollution and construction dust. If you can help us with technical or medical expertise or other evidence, please contact us on wendybacon1@gmail.com. If you see any errors, let us know and we will fix them.